In a new school and determined to keep her secrets from being discovered, Thorn finds a mysterious locket that leads to a shocking discovery--the unmarked grave of a newborn baby. Surrounded by new friends she barely knows, as well as the school's famous former student, a smoking-hot musician named Phillipe, Thorn must investigate to find out if one of them is a murderer. Thorn is a finder. She has a special ability where she gets visions when she touches an object and she can match the lost object with it's owner. She's basically a human lost and found. One day she comes across a heart-shaped locket hung on a shoelace, and the whole story is based upon this locket. Although Thorn may not be my favorite character, mostly because she seemed idiotic at times with her notions of revenge on the Grin Reaper, Buried was a good mystery. Although at first it seemed like there were too many things going on at the same time and the plot was all over the place - the singing competition, Philippe, Grin Reaper, the locket and the letter - it all made sense and the story picked up a steady pace half way through the book. Initially, I couldn't quite relate to Thorn, her thoughts got on my nerves and I didn't get the whole name thing (Thorn's real name is Beth by the way) but she got better. The surrounding characters - K.C., Rune, Grin Reaper and Amelie - were all likable except her dad, he was just frustrating. I didn't really see the whole goth element though. If not for how Thorn described herself or mentioned what others said about her, you wouldn't know that she was supposed to be 'goth'. She was a normal girl with family/friend and her own issues. Frankly, it wouldn't have made a difference whether she was Goth or not to me. And Amelie's fairy thing was cute but if we're speaking realistically, it's also a little weird. 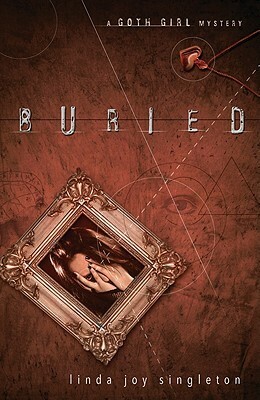 Overall, Buried is a quick, unique and interesting read. While it's not a book I'd stay up nights reading, it's the kind I'd pick up when I'm looking for something to keep me absorbed for a few hours. It didn't bore me. I didn't know that this was a spin-off series but I wouldn't mind checking out Don't Die, Dragonfly , book one of The Seer series by Singleton.